In this day and age, there are numerous factors that can affect our health. For someone like me, a twenty-something working girl, it's the schedule of my work, exposure to unhealthy food (or lifestyle, in general), and the stress that professional and personal obligations may bring. If I had things my way, of course, I would like to have regular trips to my favorite spa to detoxify at least once every 2 weeks and get rid of all the bad juju in my body! I was delighted when I was invited by BlueWater Day Spa a few weeks back to showcase their new newest and freshest services along with their new brand ambassadors: Wynwyn Marquez, Ken Alfonso, Miss Universe 2013 Third Runner-Up Ariella Arida, and Christian Bautista. 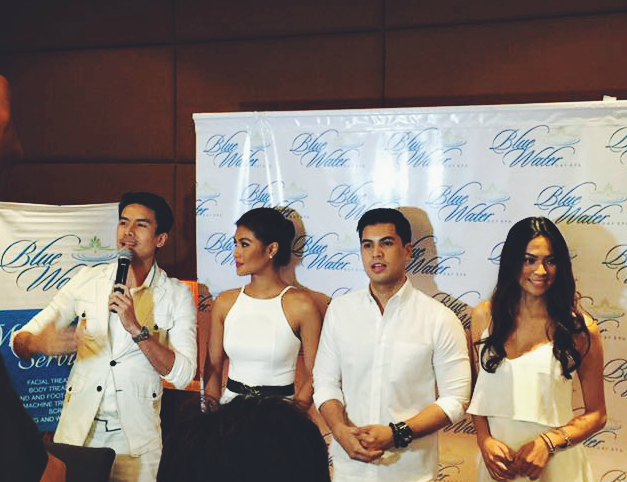 The brand ambassadors during the media launch last September 15, 2015. When Christian was asked which BWDS treatment fits his needs, he swears by the Therapeutic Colonic Massage, and added, "As a performer, my schedules are hectic and always changing, so I have to be in the best shape possible to meet all the demands of my work. The long nights and late meals do take a toll on my body. With the BlueWater Day Spa Therapeutic Colonic Massage, I feel better and have more energy. It’s a gentle detox that serves a dual purpose, because it helps you lose weight, too." The Therapeutic Colonic Massage helps gently remove excess toxins from your body, starting with those that have accumulated in your digestive system. The treatment concentrates on the core (abdominal area), loosening the hardened blockages in your system through massage. The body then naturally expels these wastes through normal body function. Enjoy the full-hour treatment, made more relaxing with the use of chamomile oil, in the calming ambiance of the Blue Water Day Spa suites. Though the massage on the abdomen itself takes approximately 20 mins, you will enjoy lasting results. Ariella Arida visits Bluewater Day Spa whenever she has the time. She pampers herself with a relaxing and beautifying Collagen Facial Treatment from Bluewater Day Spa to keep her skin looking youthful with that special glow. Actress Wyn Marquez keeps herself physically fit with various exercise regimens. But when it comes to looking her best, she visits Bluewater Day Spa for her Photo Therapy Flash (IPL) Treatment. Using a highly advanced yet safe laser technology, this removes unwanted hair permanently. After hearing their favorites, I am personally interested with Christian and Ariella's picks. I mean, destressing at the same time helping you achieve faster weight loss? That sounds like a great deal to me! And with BlueWater Day Spa offering facial treatments as well, I wouldn't mind spending and pampering myself here from head to foot! For franchising information, please call (02) 695-1820 or (02) 669-1634.